This is the first 25k Relay National Championship ever held in the USA. 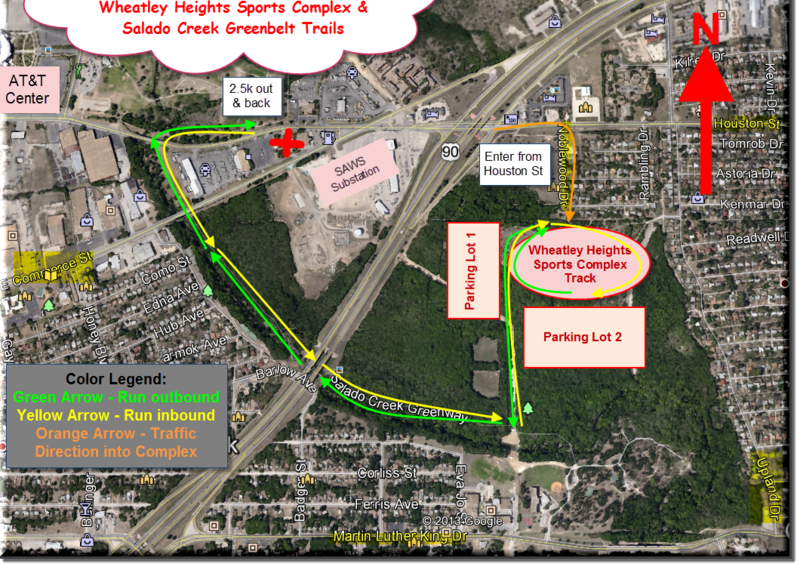 Composed of 5 runners, running alongside highly shaded Salado Creek in Comanche Park, 2600 Rigsby Ave. SA Tx. 78222. A very fast, flat course sanctioned by USA Track & Field over a certified course. $20,000 total prizes, $5000 in cash, plus a Red, White & Blue Best Costume contest. Finishers Medal to all Finishers in all races plus awards to 1st, 2nd, & 3rdto all 51 divisions. All kids in the 400m get a medal. 1st Relay (men & women) will be declared National Champions. Cash prizes to fastest times in 5k, 25k, & Relay, men & women. Medals are heavy Olympic size for the 5K, 25k & Relay. The Free Spirits are a 501c3 Public Charity, started in 1968 with over 125,000 athletes participating in our events. We sponsor The Free Spirits Track Festival, since 1973, 6 summer track meets in Jun and Jul of each year for people of all ages at local San Antonio tracks. 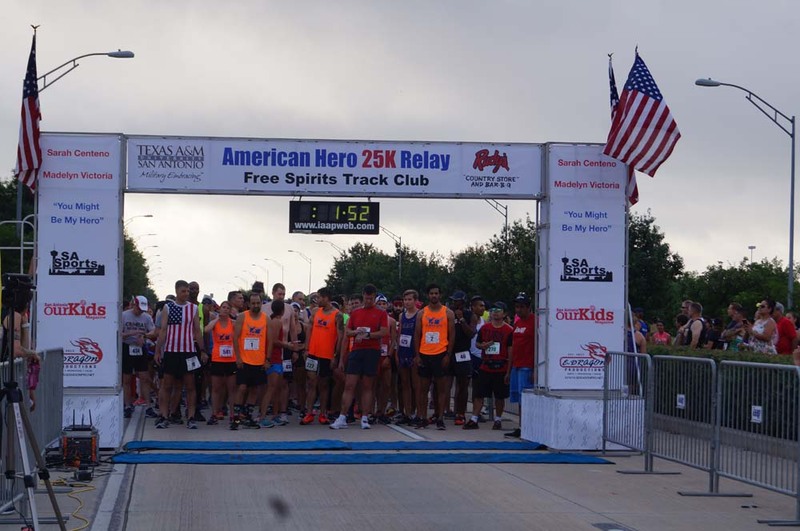 We sponsor The American Hero 25k Relay, last Sunday in May of each year and the Free Spirits Volunteer’s Dinner in Aug.
Entertainment by Madelyn Victoria singing “You Might Be My Hero,” and Max Garcia. Master of Ceremonies. Free food and drinks for all runners and guests. Invite the whole family. Times: From 7am to Noon. The event will be held just a few miles southeast of downtown beautiful San Antonio rated one of the oldest and friendliest cities in America. Its River Walk, lined with restaurants, patios, galleries and shops, is one of the prettiest and longest in the world. The entire family can enjoy Fiesta Texas, SeaWorld, the Alamo, Tower of the Americas, La Villita, our missions, Salado Creek Greenway, and hundreds of running trails all over the city. We also have the best Texas BBQ and Mexican Barbacoa. Be part of this once in a lifetime memorial event. 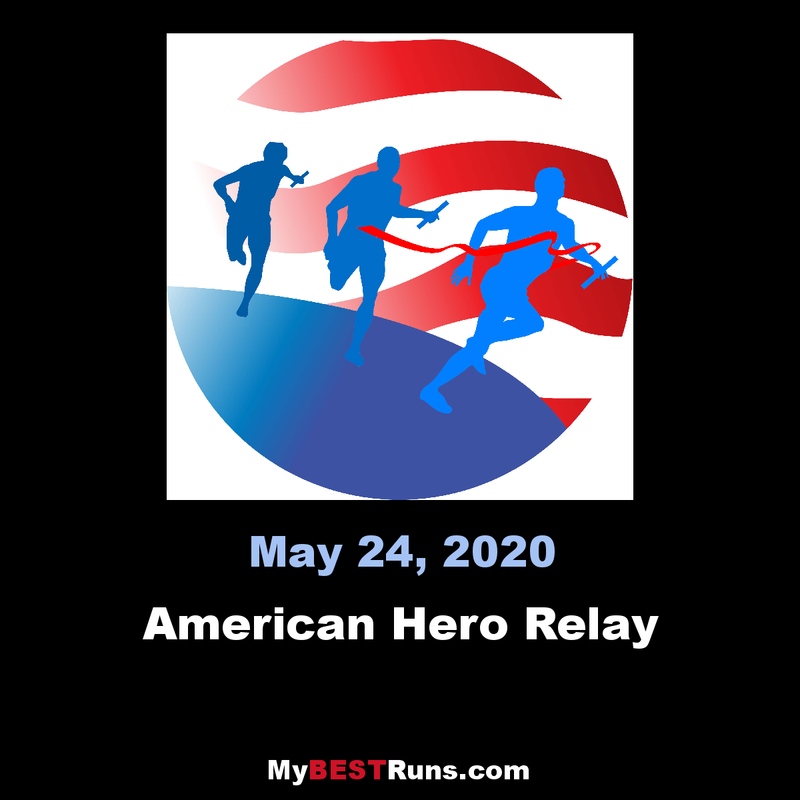 The American Hero 25k Relay was established to raise the funds for the charities and scholarships. The AH25k Relay committee includes: Jennifer Meils, Willie Canela, Stefanie Meyers and Jesse Martinez. Special thanks to Jennifer & Matt Meils (for producing) & Madelyn Victoria (vocalist) on our theme song "You Might Be My Hero." Folks and organizations that have contributed their time and effort include: Richard Delgado and (Texas A&M University - San Antonio, Military Liaison), Jay Tope (DJ and owner of SAsports.com), Vanessa and Monica Del Fierro (owners of Mariachi Las Coronelas), Ashlee Rose, 2013 Texas Music Award Female Vocalist of the Year, Sara Centeno Band, Carissa Smith (Lady Heat Rays Cheerleaders), Donnie Edwards (rated world's best Elvis Presley Tribute Artist), Robert Hernandez (Urban Uniforms), and Jose Iniquez (IAAP Race Director), Texas A&M-San Antonio, San Antonio Our Kids Magazine. And finally, our gratitude for the volunteers that have helped us throughout the years: Patricia Lejarzar, Misty Lejarzar Digges, Summer Melody Kline, James Dove, Derenda Villacillo, Jean Quintanilla. The 25k Relay is the first 25k relay National Championship in the USA. It is 90% shade, very fast, flat on a certified course alongside beautiful Salado Creek.